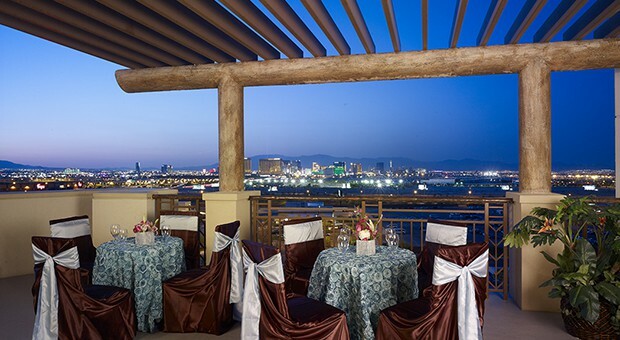 Plan your Las Vegas business meetings, training sessions or conferences in our unique tropical setting. Just right for small- or mid-size groups, business or pleasure. Allow us to help host your next event. If you’re looking for an intimate executive boardroom for 20 or something larger, allow us to help you host your next event. We make it easy to plan a successful, productive conference or meeting. With expansive views and two private balconies overlooking the Strip, this 10th floor meeting room offers approximately 1,700 square feet of space. Ideal for larger events, with a table or a classroom style setup. The courtyard is the ideal location to host a welcome reception, barbecue, or al fresco event for your conference. This outdoor function space provides all the room you need to customize your open-air experience. At a roomy 1,500 square feet and including a kitchen area, this Las Vegas meeting space easily accommodates your mid-size meeting or event. A cozy space for small meetings, this interior room keeps your group focused on the presenter as well as on the work at hand. Our services team can assist you with a number of arrangements for all of your meeting needs. Please ask our staff for more information. If there’s something you’re looking for that’s not on the list, please don’t hesitate to inquire.